Sukriti started her first lessons in music under the guidance of Miss. Krishna Dasgupta. She started learning Hindustani vocal music from Mrs. Shikha Ganguli in 1983. She has also had the privilege of learning from Late Shri. Vinay Chandra Mudgal and Late Shri.Vinod Kumar Mudgal. At present she is learning Hindustani Vocal Music under the able guidance of Pt. Madhup Mudgal. Sukriti sings ‘Classical based Bhajans on the occasion of Birth Anniversaries and ‘Nirgun Bhajans’ at Death Anniversaries and Prayer meetings of leaders like Indira Gandhi, Rajeev Gandhi, Lal Bahadur Shastri etc. Sukriti has also sung Bhajans for Music Today of which CD’S & Cassettes ‘Bhajan & Arti’, are available. Sukriti has impressed many with her memorizing slokas as Invocation at Inaugurations, business meetings of all kinds. Sukriti is also the voice of ‘Mrigya’, the nine member band which plays ” funky fusion music”. 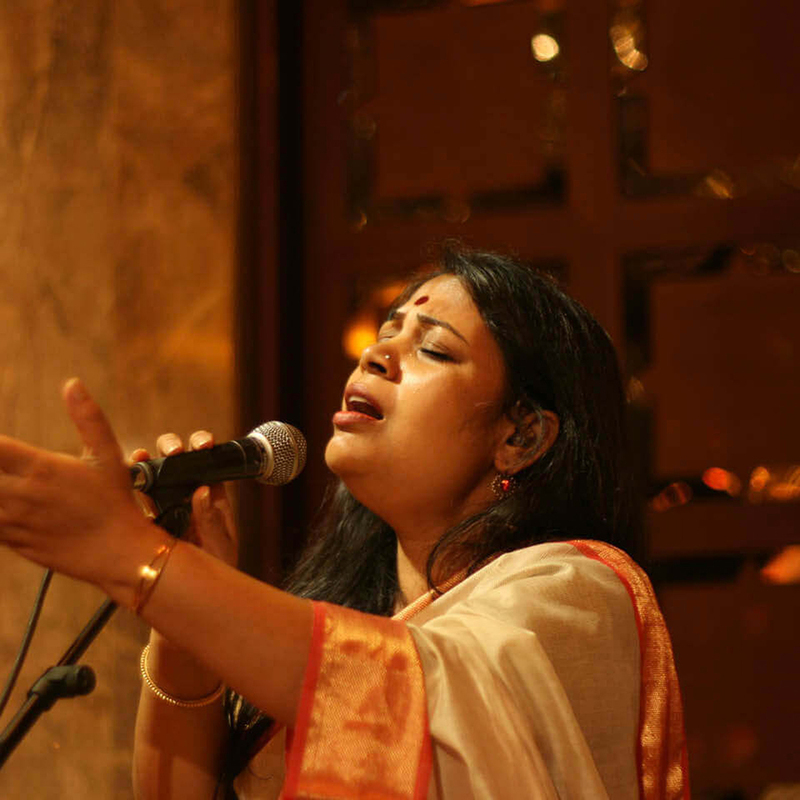 Sukriti is the vocalist for the 80 percent Indian classical input in its compositions. With the group she has performed in countries like Indonasia, U.K, Singapore, Dubai, Germany, Switzerland, Spain, Italy, South Africa, Canada, U.S.A and Egypt. With Mrigya she had the chance to perform in the ‘Performing Art Festival’, Edinberg. Their performance was highly appreciated by the people of Edinberg. Sukriti has also performed at many shows with the famous Prem Joshua group as a semi-classical vocalist. Sukriti is a regular TV & Radio artist. She sings Advertising Jingles and semi-classical songs with DJ’s as well. The title song of the serial ‘Meri Saheli’ & ‘Hum Pardesi ho Gaye’ has been sung by Sukriti.